Learn the pragmatic tools, techniques, and leadership skills needed to build a solid foundation in the evolving discipline of software architecture. I really enjoyed Dianne’s presentation. Would it be possible to have a soft copy of the presentation? Sure, the security you gain is process isolation, so even if there are vulnerabilities found and you are running a version of Node that has a vulnerability, hackers have to do the extra work to reach your process since its... Read More. The O'Reilly Software Architecture Conference video compilation, with recordings of all tutorials, keynotes, and sessions (subject to speaker consent), is available for viewing in Safari. Most software development conferences focus on increasing your skills by providing in-depth technical sessions. 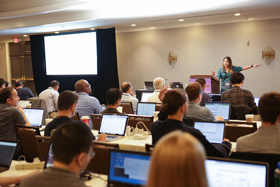 The O'Reilly Software Architecture Conference focuses on technical breadth as well as depth. Understanding the tradeoffs, technology options, and engineering practices is critical because the long-term success of many companies balances on the effectiveness and versatility of the software architecture teams that design, implement, and deploy it. For 2016, our theme is evolution, and for the San Francisco edition we'll focus on domain-centric and product architectures. We'll explore hypothesis-driven development, microservices, reactive architectures, continuous delivery and how the the role of architect has broadened in recent years, encompassing disciplines like DevOps and security. It's the 25th anniversary of the Agile Manifesto: What has become part of the architectural canon and what still needs to be built? Architecture and the architect's role continue to evolve, and we'll document that journey. Immerse yourself in two days of in-depth education on critical topics. Each training takes place Sunday, November 13 through Monday, November 14 and is limited in size attendees to maintain a high level of learning and instructor interaction. I’m a Software Architect, Now What?